Captain - Peter Easop Sr. Vice-President - John Brancaccio, Jr. 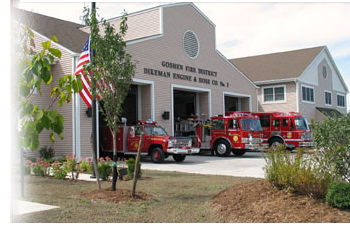 The name of the Dikeman Hose Company reflects the interest and contributions of a prominent citizen of Goshen. He was Edwin Dikeman, who was born in Warwick, NY in 1835. A prominent businessman, he operated for many years the apothecary shop on West Main Street under the name of Dikeman's Drug Store. Founded: September 18, 1873. Mr. Dikeman's civic interests were notable. For eleven years, he was a trustee of the Village of Goshen, and for four terms he served as president of the community, a title that would be replaced by mayor at a later date. The Goshen Fire Department was also among his interests, his membership and activity beginning in 1852. The Hose Company which bears his name was organized mainly through his efforts, and the name was in response to what he had done. He was hailed by his contemporaries as a leading fireman in this part of the state, and the Excelsior Hose Company of Port Jervis made him an honorary member. He also represented the Dikeman Hose Company at a firemanic convention held at Kingston, NY in 1882. Details of the actual organization of the Company appear in the meticulously hand-written minutes of the village trustees during their meeting of September 11, 1873. 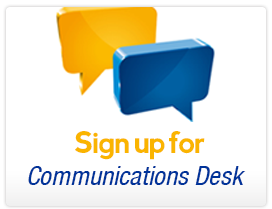 On the following night, another meeting was held in the rooms over Dikeman's Drug Store on West Main Street. Present as the "founding fathers" were George Smith, William H. Wood, John T. LaRoe, E.T. Sparks, Edward Dalton, G.P. Crans, and Jerry Baldwin. Wood was named Foreman of the new fire company, Sparks became the Assistant Foreman, and Crans and LaRoe were chosen as Secretary and Treasurer, respectively. Six days later, on September 18, another meeting convened and the Company was named Dikeman Hose Company No. 3, thereby cementing into the village annals for all time the contributions and civic interests of Mr. Dikeman. Also, the first additional members were elected on this occasion: Abram Fuller, Charles Wells, James McManus, H.S. Wilcox, and William Dayton. With the initial paperwork out of the way, we can safely assume that the members of the new Company anxiously awaited the first fire call. The first call the Company answered was in April 1874 when the alarm, sounded on bells at the time, called them to a fire in the West Main Street building occupied by Hoyt's Dry Goods Store. The Dikemans achieved initial glory, for they were the first to get water on the flames. In appreciation of their services, an insurance company awarded them a $10.00 prize. A Greenwich Avenue blacksmith shop was the first place where the Company stored its equipment and after three subsequent moves, the Dikemans entered their present location in 1885. In reviewing a hundred and thirty years of achievement, it is important to pay tribute to some of the members who did so much for the outfit in the early days. Charles E. Wright served as Foreman (we call it Captain now) for eleven years and also served as the Company President. The honorable J.B. Sweezey was Company President for many years, and James Lundy was another who held many offices with the Dikeman Company. 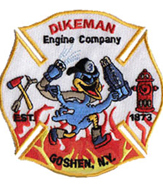 In 1918, almost half-way through the first "Dikeman Century", the company had one of their members nominated and elected to the post of Chief of the Goshen Fire Department for the first time. Edward J. Farrell, born in Wappingers Falls on April 25, 1868, began his career with the Dikemans at the age of nine as a torch bearer and hose tender on September 12, 1877. He was known throughout the state for his prowess as a fireman, and served as Chief of the Goshen Fire Department from 1918 to 1922. Eleven years later, in 1929, another Dikeman rose to the rank of Chief of the Goshen Fire Department. Joseph C. Donovan was born in Goshen on January 12, 1892. He joined the Company on March 7, 1916, holding several offices in the Company prior to his being elected Chief of the Department. Known as a hard taskmaster, he gained the respect of his men through his sincere interest in their safety, his demonstrated knowledge of firemanics and his unwillingness to send a fireman into a dangerous situation unless he led the way. His leading of others into burning buildings gained him the nickname throughout the county as "Smokey Joe." He served as Chief of the Goshen Fire Department from 1929 to 1940. The Dikeman Hose Company waited another twenty-six years before another from their ranks achieved the coveted post of Chief of the Department. Alfred R. Turi, born in Crystal Run on July 4, 1919, was elected in 1966. Joining the Company on May 4, 1938, he served as Second Lieutenant, Captain and Engineer of the company during the period 1949 to 1966. Aside from being a great leader by example, Chief Turi was an advocator of fire training and a student of fire science and tactics. Chief Turi was also instrumental in organizing the Goshen Fire District as it is known today and served as Orange County Fire Coordinator in the years following his term as Chief..